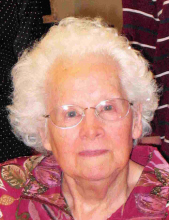 Maxine Elizabeth Kiracofe Layman, 99, of Dayton, passed away Monday, April 8, 2019, at the Bridgewater Home. She was born in Dayton on November 5, 1919, and was a daughter of the late Frank Andrew and Rutha M. (Hess) Kiracofe. Maxine was the oldest member of the Dayton Church of the Brethren. She retired as the cafeteria manager at Dayton Elementary School. She graduated from Beverly Manor High School in Staunton. She was united in marriage on February 7, 1942, to Ward Good Layman, who preceded her in death on May 7, 2004. Surviving are her daughter, Ellen K. Layman, of Bridgewater; two sons, W. Gene Layman and wife Kara Dee, of Harrisonburg and Larry W. Layman and wife Joan, of Halifax; her sister, Dorothy Kiser, of Penn Laird. She is also survived by four grandchildren and four great-grandchildren. She was preceded in death by three brothers, Ray Kiracofe, Dwight Kiracofe, and Leo Kiracofe, and a sister, Lois Stover. A memorial service will be held at 4:00 PM on Sunday, April 14, 2019 at Dayton Church of the Brethren with Rev. Kevin Daggett officiating. Burial will be private. In lieu of flowers, memorial contributions may be made to Dayton Church of the Brethren, P.O. Box 236, Dayton, VA 22821. To send flowers or a remembrance gift to the family of Maxine Elizabeth Kiracofe Layman, please visit our Tribute Store. Rev. Kevin Daggett officiating. Burial will be private. The family will receive friends following the service. "Email Address" would like to share the life celebration of Maxine Elizabeth Kiracofe Layman. Click on the "link" to go to share a favorite memory or leave a condolence message for the family.